The sun’s not out yet after three days and three inches of rain, yet I’m humming this song as I stroll past the rain garden I developed last year and completed this spring. It’s working! All that run-off is draining from the hilltop and orchard into the dry creek and on to the rain garden as intended. I’m pleased that finding a practical solution to draining our wet lot has led to such beauty. (See How to Drain a Wet Lot). 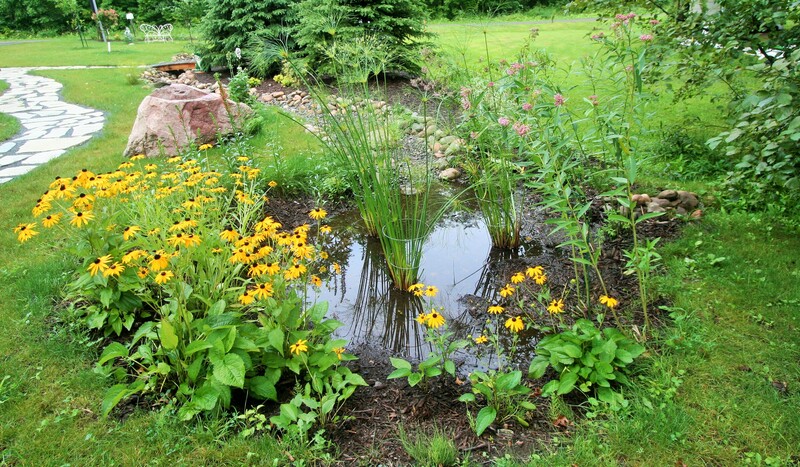 A rain garden is a plant bed that collects rain runoff and holds water for a short time, usually less than twenty-four hours, while it absorbs excess water into the soil. If planted with native species, it should never require fertilizer or pesticides to thrive. In fact, the plants purify the water before it slowly drains into the nearby lake. The diagram shows a shallow depression dug with an inflow and overflow designed for three moisture zones. The tall plants selected for Zone A need to tolerate periodic standing or flowing water. Mid-height plants that like average soil conditions may be used in Zone B. Zone C plants should be able to tolerate average to dry conditions and tend to be shorter plants. 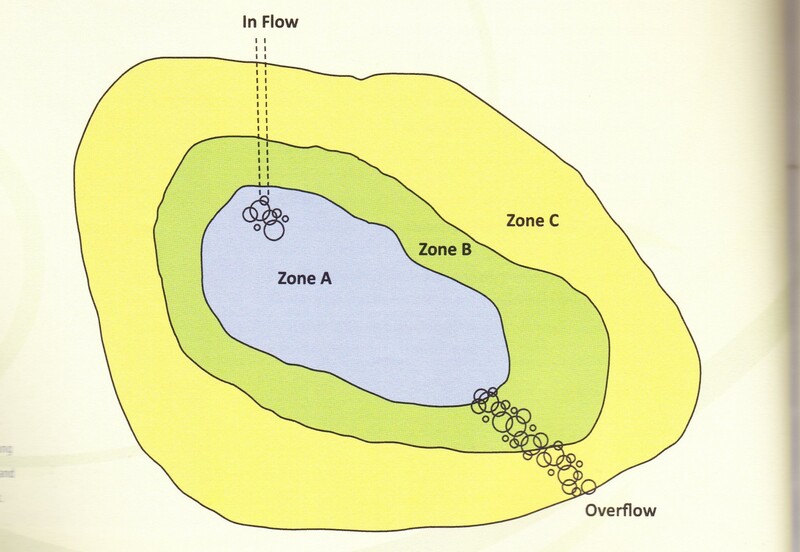 Saturations Zones A-C showing inflow from the dry creek and overflow into a natural area and lake. I tried blazing stars for my tall plants in Zone A last year; unfortunately, they did not withstand periodic water. This year, I used three papyrus plants instead. So far, they are holding up well, with strong roots that absorb water well. I used black-eyed susans, cardinal flowers, swamp milkweed, and turtle-heads last year for Zones B and C. This spring, all these perennials came up again. They are now in full bloom. 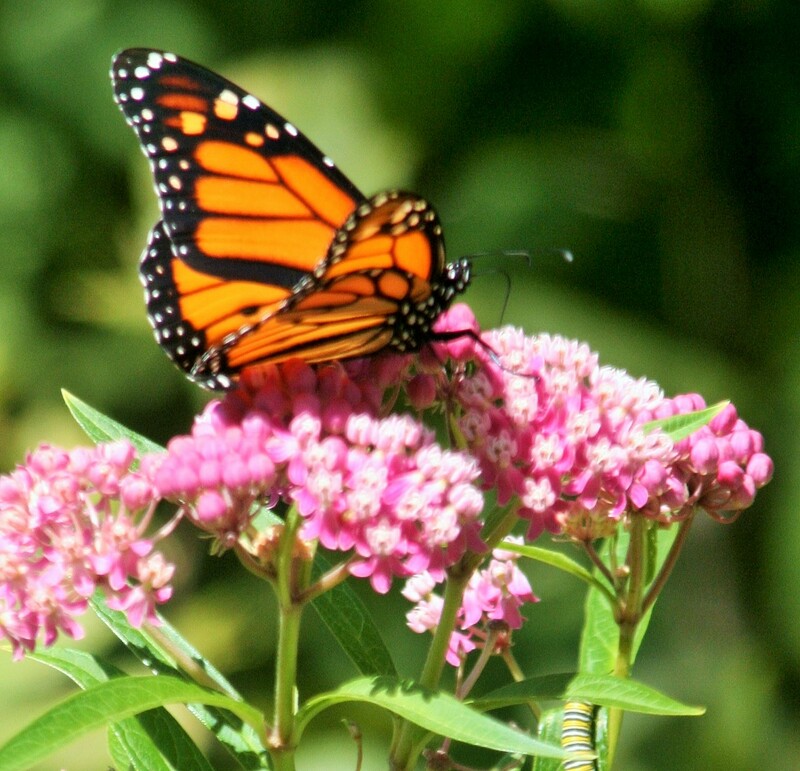 Swamp milkweed plants perform double duty: they provide a migration path for monarch butterflies. I’ve seen a few already and expect more in September. The Rain Garden in action. A Monarch Butterfly alights on a Swamp Milkweed blossom. To make the transition to the “natural garden” next to the lake, I planted Joe Pye weeds, a wildflower that grows naturally in Wisconsin. All in all, I’m quite satisfied with the result. 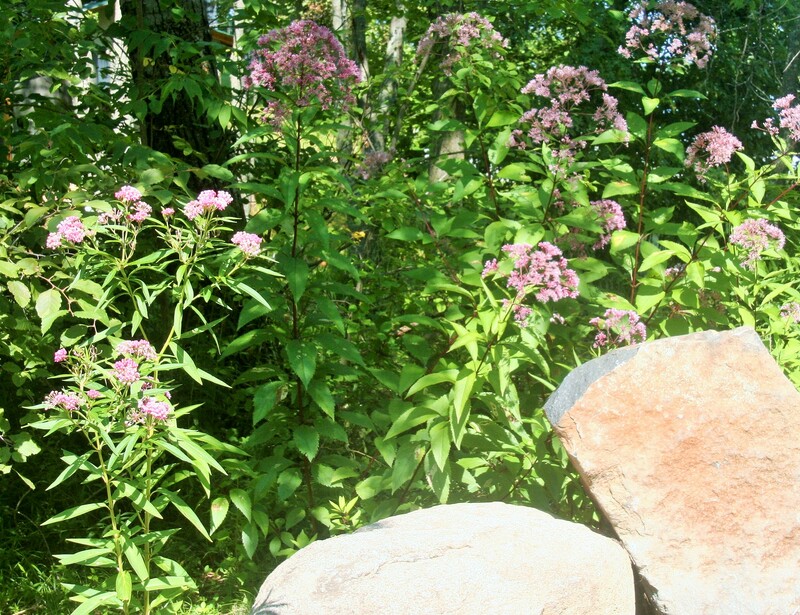 Swamp milkweek at the perimeter of the Rain Garden leads to a natural planting of Joe Pye weed. Beautiful, practical and ecologically perfect! Thanks, Gracie! I enjoyed researching, developing and implementing the project. I’m happy to see it working and providing beauty as well. Indy, landscaping and gardening are very fulfillilng. I prefer it over cleaning and cooking, because there is something to show for it afterwards, I get a sense of completion, and I can use my creativity. Thanks to Dale Schock and Lake Services Unlimited for their help and creative input to my project. More beautiful shots, Lois. And I’m glad to hear the rain garden you designed so well is working so efficiently. Good for you, girl!!!!!!! Joni, Thanks for the compliment!